A special flight permit can be issued to any U.S. registered aircraft that may not currently meet applicable airworthiness requirements but is capable of safe flight. Before the permit is issued, a Federal Aviation Administration (FAA) aviation safety inspector (ASI) may inspect the aircraft or require it to be inspected by an FAA-certificated airframe and powerplant (A&P) mechanic or repair station to determine its safety for the intended flight. The inspection is then recorded in the aircraft records. This type of special flight permit is often referred to as a “ferry permit” because it allows the aircraft to be ferried to a location for maintenance. In the case of general aviation flights (e.g., flights conducted by operators other than Title 14 of the Code of Federal Regulations (14 CFR) part 121 or part 135 certificate holders), special flight permits are issued by the FAA Flight Standards District Office (FSDO)/International Field Office (IFO) having jurisdiction over the geographical area in which the flight is to originate. A special flight permit is issued to allow the aircraft to be flown to a base where repairs, alterations, or maintenance can be performed; for delivering or exporting the aircraft; or for evacuating an aircraft from an area of impending danger. It may also be issued to allow the operation of an overweight aircraft for flight beyond its normal range over water or land areas where adequate landing facilities are not available. CAUTION: If an Airworthiness Directive (AD) requires compliance before further flight and does not have a provision for issuance of a special flight permit, the operation of the aircraft to which it applies would not be appropriate, and a special flight permit will not be issued. A special flight authorization allows a foreignregistered civil aircraft that does not have the equivalent of a U.S. standard airworthiness certificate to be operated within the United States. A civil aircraft registered in a country that is a member of the International Civil Aviation Organzation (ICAO) only needs a special flight authorization issued by the FAA. A civil aircraft registered in a country that is not a member of ICAO must have both an authorization from the United States Department of Transportation (DOT) and a special flight authorization issued by the FAA. To obtain a special flight authorization, you must apply by letter or facsimile. The application and issuance procedures are provided in FAA Order 8130.2 (as revised), Airworthiness Certification of Aircraft and Related Products, Chapter 7, Special Flight Authorizations for Non-U.S.-Registered Civil Aircraft. You can obtain assistance and the necessary forms for issuance of a special flight authorization from the local FSDO or IFO. A special flight permit is an FAA Form 8130-7, Special Airworthiness Certificate, issued pursuant to 14 CFR part 21, section 21.197, for an aircraft that may not currently meet applicable airworthiness requirements but is safe for a specific flight. CAUTION: A special flight permit is not an authorization to deviate from the requirements of 14 CFR part 91. Any other information requested by the Administrator, considered necessary for the purpose of prescribing operating limitations. 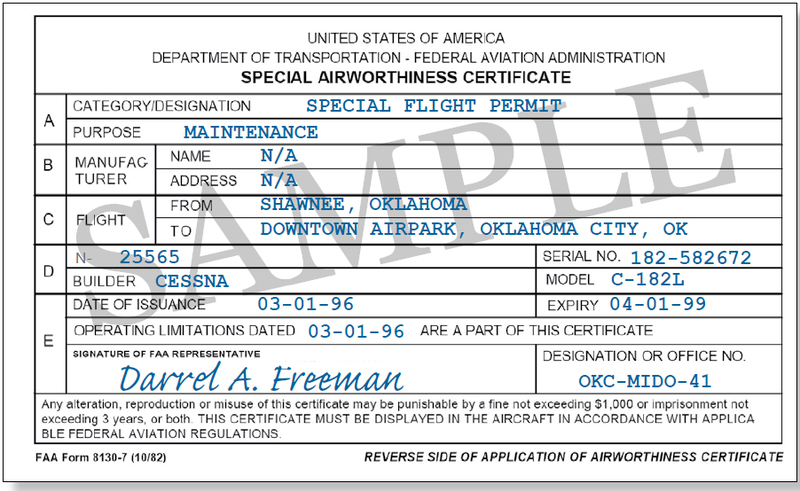 A current copy of the Airworthiness Certificate. A current copy of the Certificate of Aircraft Registration. A current copy of the front page of the aircraft and engine(s) logbooks, with all entries completed, (i.e., aircraft, engine(s), propeller(s), manufacturer, model, serial number). A current copy of the Aircraft/Engine/Propeller/ Appliance AD compliance status. A copy of the last Aircraft Log Book entry, stating that the aircraft has been inspected and is in a safe condition to fly/ferry, that the aircraft is in compliance with all applicable ADs, and/or a listing of the ADs with which the aircraft is not in compliance. The entry must be signed by an A&P mechanic or 14 CFR part 145 repair station. Figure 5-1. FAA Form 8130-6, Application for U.S. Airworthiness Certificate. 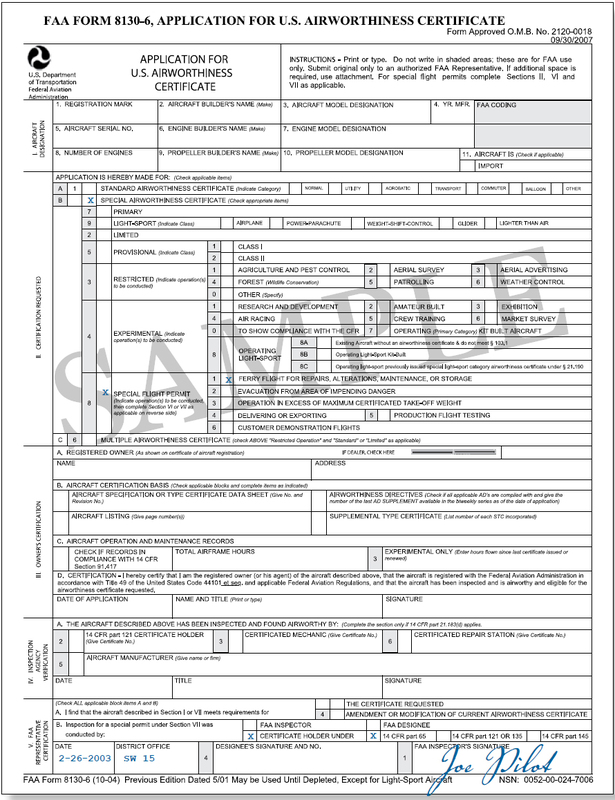 You can obtain instructions for completing FAA Form 8130-6 on the FAA website at www.faa.gov or from your local FSDO. The Administrator may also want to inspect the aircraft in question before approving or issuing a ferry flight permit. You may request that the local FSDO transmit the ferry permit via facsimile if the request is time sensitive. 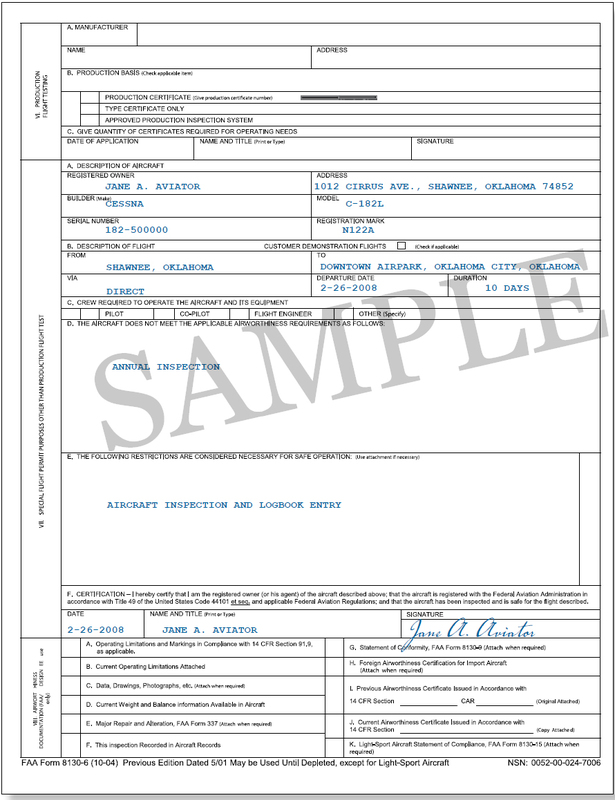 Figure 5-2 is a sample FAA Form 8130-7. Special Airworthiness Certificate, as a special flight permit. The aircraft operator must display, in the aircraft, the current airworthiness certificate and the special flight (ferry) permit along with its operating limitations. For additional information, please refer to 14 CFR part 21, section 21.197, or your local FSDO.